Have you ever been in your shop standing over a work piece, your eyes scrunched up and your body craned over trying to awkwardly not block light while also working on a piece? You will understand my struggles recently as I was attempting to cut some dovetails in my basement workshop. I have decent lighting in the shop but I have discovered that no matter how much light you have around it never seems to be in the right place. Enter the LED Magnetic work light that Highland has available. First let me explain, my shop is a small room in my basement that I converted from an office space. The shop has a tendency to spill over into my garage and the rest of the basement, especially since my small shop space is dominated by my Powermatic standing Lathe (The 3520B for those keeping track at home.) 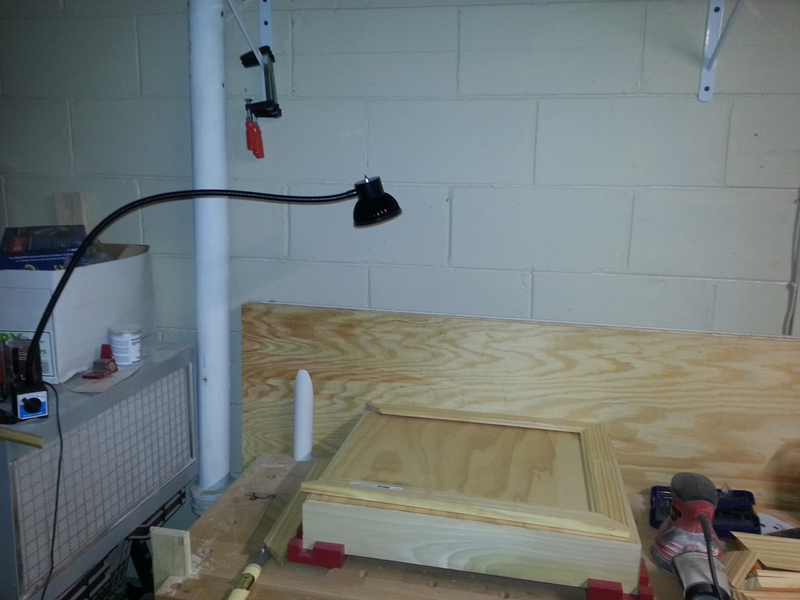 What this means for my lighting issues is that, in my woodturning shop space, I have pretty solid light while in my semi-shared garage space the lighting is less than desirable. I purchased the magnetic LED work light recently on a trip to Highland and have been experimenting with it around my shop as I work in the evenings. Having a day job really cuts into the amount of time I can devote to working in the shop and I find myself wanting to work on projects rather than hang a new light fixture or re-arrange my bench placement. The LED work light steps in and solves most of my lighting issues with the flick of a single switch. The light itself has a magnetic base that, through the magic of science, can be turned on and off via a toggle switch on the base. This allows you to engage the magnet only when needed and keeps you from having to struggle to remove the lamp once you are done with it. Let me tell you, the magnet is strong. I have some wood storage over my bench and the magnet was able to support the lamp hanging upside down from the rack, pretty nifty. The light also possesses a swiveling adjustable snake arm, professionals call it a gooseneck, that allows the light to be positioned in all sorts of contorted poses so that you get the light exactly where you need it. This means no more back aches from trying to contort myself around the bench and not block my overhead garage lights. 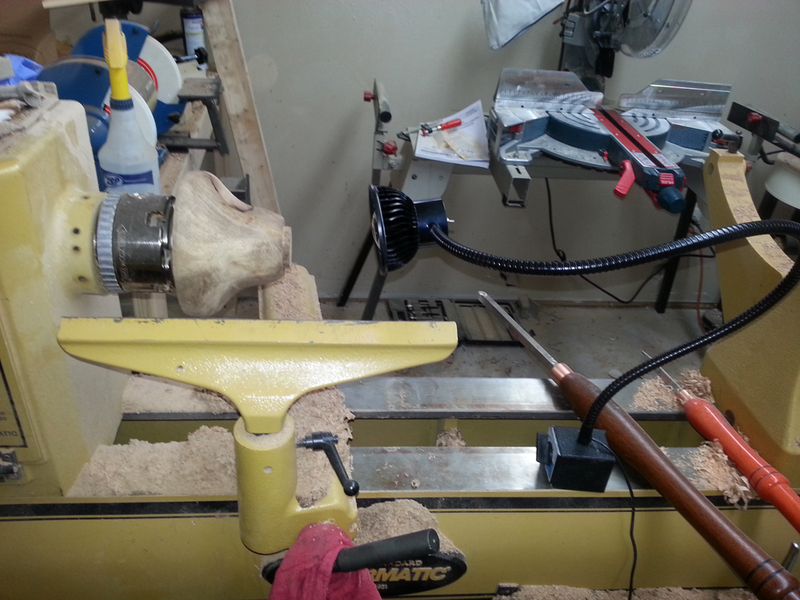 It also means that when I am turning on the lathe I can swing the lamp around and get some light inside my bowls or deep vessels which allows for a better turning experience. I’m still experimenting with the light, but it has proven to be a wonderful addition to my workshop. The LEDs are bright, the illumination strong and the ability to get the light where I need it priceless. The lamp stays cool so I can bring it in close to pieces without risking damage and everything is housed nice and tight so the ever-present and pesky dust won’t seep in. The model I picked up is currently priced at $59.99 and is worth every penny I paid for it. You can find the light here http://www.highlandwoodworking.com/flex-arm-magnetic-led-work-light.aspx so get them while they last.